Methat Bey is a hoarder. He collects hand-powered flashlights, newspapers, encyclopedias, and clocks. He lives in an apartment that has a socially immature superintendant named Ali. Ali never leaves the building for fear of angering the more prestigious residents; Methat encourages Ali to stand up for himself. After a minor earthquake, the other residents want to demolish the building and build a new one. It will be smaller, but it will be new and it will be more earthquake-proof, or so they believe. Methat thinks the building is solid enough, and even has an engineer’s report to back him up. 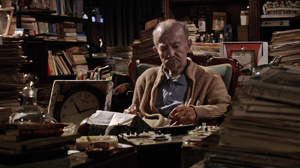 One can guess that Methat’s motive has to do with his “collection” — he surely doesn’t want to be forced to disturb the piles of clocks and newspapers he has arranged in his apartment. The movie opens on Methat walking around outdoors, browsing through the markets, he becomes confined to his apartment (which can’t be good for his asthma triggered by dust). He asks Ali to go out and gather his daily newspapers, watches, clocks, and other stuff for “the collection.” Ali is afraid of leaving the building but Methat encourages him to stand up for his rights and help him out and earn a little money in the process. The title refers to both a quest for the perfect clock (one model is 10 minutes slow after 193 days) and to the valuable missing volume (11) of a set of Turkish encyclopedias. 10 to 11 is slow paced (like so many films at this year’s TIFF), yet it’s much more approachable because of the charismatic lead, an old man with a jaunty straw hat who teaches the shy Ali to assert himself. The film treats its protagonist with kindness and respect. His hoarding doesn’t make him a freak; his friends and family know to respect the “collection,” in spite of their own views. A stranger walking near a cemetery asks his help reading Ottoman Turskish inscriptions, something her own generation can’t do any more. Maybe his hoarding is just another way of connecting to the past. If Methat has every newspaper from the last fifty years, wouldn’t that be worth something? The film has strong visuals throughout — the crowded city marketplace, the cluttered hoarder’s apartment, and most strikingly, a final scene in a near-empty room with only three things in it. 10 to 11 has the slow, browsing pace of an old man. But there is wisdom in it if you look past the surface. You don’t have to delve so deeply as to read every newspaper in the stack. Just recognize that there may be some valuable stories under the dust.